Two thirds of MPs would support an expansion at Heathrow. A new poll by ComRes revealed 67% of MPs back plans for a third runway at the airport. John Holland-Kaye, Heathrow's chief executive, says a third runway would help open up dozens of new markets for UK exporters, bring more tourists into Britain and generate tens of thousands of new jobs. A Government decision on whether to boost capacity at Heathrow or Gatwick is expected to be made in the coming weeks. Tory MP Stephen Crabb, who is among those supporting expansion at Heathrow, said: "I'm convinced now more than ever that we need to get on with expanding our hub airport. "Expanding Heathrow will bring real benefits to communities up and down our country, unlock new trading routes for our small business exporters and create thousands of apprenticeships for our young people - and that's why a third runway is overwhelmingly backed in Parliament." It emerged last week that an internal Government document revealed ministers could be given a free vote on the expansion issue. The paper, which was filmed by a passenger on the London Underground, discusses the ''potential waiving of collective responsibility''. The long-awaited decision is politically highly sensitive for Prime Minister Theresa May because of divisions within the Tory ranks. Foreign Secretary Boris Johnson campaigned against Heathrow expansion when he was London mayor, while Putney MP and Education Secretary Justine Greening is also opposed. 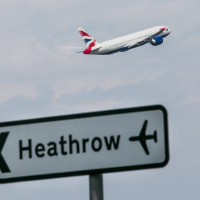 Heathrow chief executive John Holland-Kaye said: "Parliament overwhelmingly supports expanding Heathrow and it's clear why. We already do what Gatwick can't, connecting every corner of Britain to growth around the globe. "Only Heathrow delivers growth for all the UK and not just in the South. The Prime Minister can be confident that by greenlighting Heathrow she'll be kick-starting her vision to build a stronger, fairer Britain for everyone." Whichever airports holidaymakers fly out of, they know they give themselves peace of mind if they take out travel insurance. Such protection covers matters such as cancelled or delayed flights. It also insures against lost passports and other travel documents, stolen possessions and mislaid luggage.